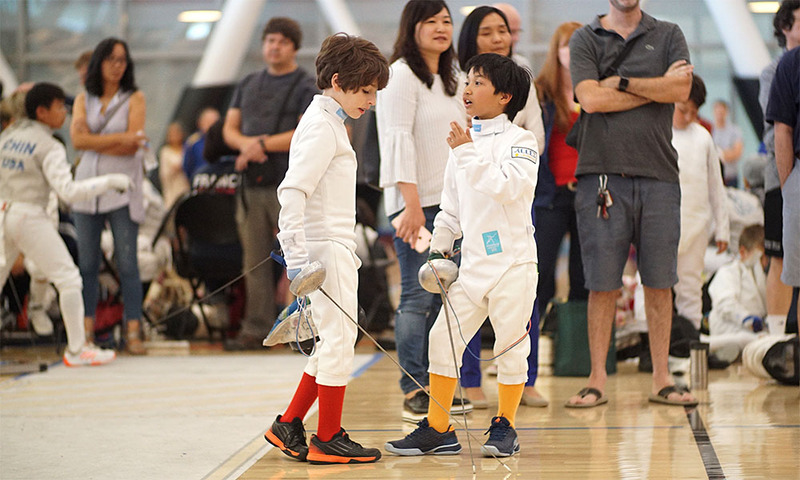 Daniel Oganesian (Swords, left) discusses strategy with Thien Scofield (Allez) at the 2017 Musketeers Region Youth Circuit in Northridge, Calif.
Below are some suggestions to help make the experience a successful one, regardless of how your child does in the tournament. This is the second part of a series meant to help guide new fencers and families through the tournament experience. Later posts will explore how a tournament works (seeding, pools, DE’s), travel tips, etc. Swords – Two are required – at least three is recommended. Your child could be disqualified if he or she does not have a working weapon. Also, Y10 fencers use a shorter blade. 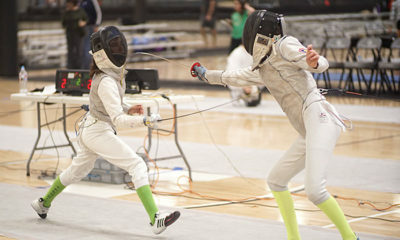 If your child is fencing in a Y10 event and a Y12 event, you should have at least four swords, two shorter, two longer. Chest Protector (mandatory for girls of all ages and for boys in Y10 and Y12. It is a good idea to invest in a club patch that should be sewn onto the non-fencing arm of the fencing jacket. This patch not only shows club pride, but, more importantly, helps coaches find their fencers in a sea of white uniforms in the larger tournaments. Coaches are often running between strips helping their students, and easily spotting that patch can make a big difference. Club Warm Up Jacket – Most fencing clubs have club jackets with the club logo. This jacket is a great investment in a number of ways. It builds team or club morale, can be worn over the fencing jacket to keep your fencer’s muscles warm, and helps coaches and referees more easily spot fencers. 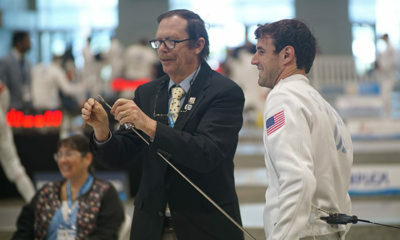 If your fencer ends the day by standing on the podium, the club jacket should be worn. Food and Water – Parents have all kind of helpful recommendations for what food and drink is best for their fencers. The first rule, really, is to bring something you know your fencer will eat. Every child is different – some want a big breakfast, some are too nervous to eat, some want to eat throughout the day, some seem to be able to eat nothing but air until the fencing is over. You will have to figure out what works best with your child. And it changes as children grow and get older. Some good recommendations are: bananas, m&m’s for a little added energy when fencing a long day (that sugar boost right before a bout late in the tournament can be a real help), pretzels, Cliff bars. Mary Huang, a veteran fencer, recommends PB&J sandwiches which “provide quick energy, the bread is a longer energy source, and the peanut butter provides staying power Easy to make and pack.” It is best to stay away from something big between the pools and the direct eliminations, as that can sometimes cause stomach cramps. But it is important to keep your fencer’s energy up, so have options available. Also, it can’t be overemphasized the importance of keeping your fencer hydrated. A leading cause of cramping and headaches is lack of hydration. We suggest water and Gatorade or Vitamin Water. You can almost always purchase drinks and bananas and some sort of snack at the venue, but not always, so don’t count on that. A Small Cooler – Helpful for keeping drinks and snacks cool and in one place. A Towel. Pretty self-explanatory (hand towel, not a bath towel). 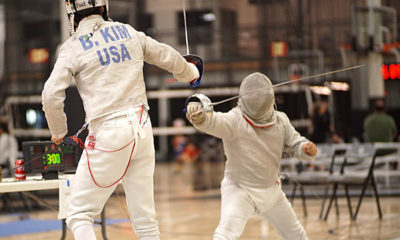 US Fencing Card – on your phone or printed out. You can log in to USA Fencing, and take a screenshot of the membership card. It has a bar code which can be scanned. Equipment Check is for your fencer’s safety. The armorer is looking for holes in gloves, masks that might be damaged or cracked in some way, and body cords, to make sure that they are functioning correctly. Weapons are checked on the strip at the beginning of each bout. Warm Up – After Weapons Check, your fencer needs to get dressed and then start to warm up. Fencers should stretch out and then a light jog around the venue is a good way to start. Jumping jacks are also good, and some fencers bring a jump rope to warm up with. The next blog will detail the structure of tournaments – seeding, pools, and the direct eliminations. Kathryn is a freelance writer and former Director of Communications at an independent school in Los Angeles. She has been a "fencing mom" for 6 years. 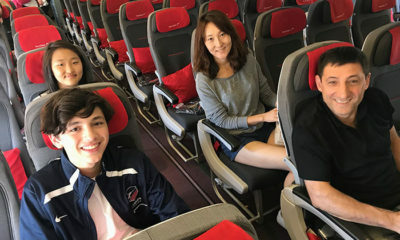 Her blog, “One Parent’s Perspective,” is a work in progress exploring and sharing both successes and failures in helping her son navigate through the competitive world of fencing. These are great recommendations and highlights of how a young fencer (and parents) should get ready for a tournament. In the beginning, my wife and I performed all these checks ourselves (rather than having my beginning fencer do them), but gradually, we have been transitioning many of the preparedness/responsibilities to our child. Great training to get ready for life! One add — which not everyone does, but we recommend: test the weapons before the tournament with a testing kit (weight/shim/cords) and eyeballs (tips/wires/loose parts) to make sure they will pass. Kids and parents get rattled if the first thing that happens is the fencer getting a yellow card because of weapon defect and you frantically search for a working weapon from friends/vendor. Thanks so much for your feedback. You are absolutely right recommending checking the weapons beforehand. Those testing kits are a great investment. Even if you don’t have weights and shims at home, fencers can find a free reel at the tournament and hook up their weapons to make sure they are working before pools begin. And also checking those screws before each bout in pools. The next article in this series goes into much more detail about the actual tournament, and includes checking your weapons, but it would have maybe been better here. Thanks again! The Fencing Tournament – When Do We Start? Where Do We Go?